Abstract: Cerebral palsy (CP), group of permanent nonprogressive clinical disorders in children, is caused by damage to the immature brain. Conventionally available treatments for CP are mainly targeted toward management of its symptoms. With the upcoming field of neurorestorative strategies, we are now able to repair the core brain damage in CP. There are various drugs, stem cells, etc, which have been implicated to have neurorestorative properties. Autologous bone marrow stem cells, umbilical cord stem cells, neural stem cells, and olfactory ensheathing cells have shown the safety and efficacy in preliminary studies. Here, we review the different medicines and cell types that have shown beneficial effects in clinical studies. We propose that combination strategies may be the future of neurorestoration. The major clinical symptoms are motor and posture dysfunction, often accompanied by impairments in speech, cognition, hearing, and vision and epilepsy, secondary muscle contraction, and deformity of limbs. Comorbidities such as seizures, mental retardation, auditory visual impairments, and language and speech disorders often coexist. But, development of various neurorestorative strategies has made this repair possible. These strategies mainly include neurorestorative drugs and cell therapy. In the past decade, cell therapy has been rapidly evolving as a potential treatment for various neurological disorders including CP. Experiments are carried out using different types of cells to study their benefits in CP. Hypoxia and ischemia cause damage to the oligodendrocytes (OLs), primarily causing CP. It leads to focal cystic necrotic lesions in the periventricular and/or central white matter, diffuse astrogliosis, microglial activation in the surrounding white matter,16 diffuse myelination disturbances,17 and injury to the cortex, basal ganglia, and thalamus. Progenitor OLs develop into pre-OLs which subsequently develop immature OLs and then into mature OL stage. In CP, hypoxia or any other insult causes damage to pre-OLs, which decreases the number of mature OLs, thus giving rise to abnormalities in myelination. This activates glial cells to secrete interferon-γ, interleukin-1 beta (IL-1β), tumor necrosis factor-α, and superoxide radicals which are the inflammatory cytokines. These eventually cause more damage to the OLs. Many animal studies have demonstrated the beneficial potency of cell therapy in CP. Few human studies are published in the scientific literature, which studied the efficacy of cell therapy in CP. Here, we have enumerated the types of cells actively studied for treatment of CP. Bone marrow is a mixture of various cell types that can be potentially used for regeneration. Bone marrow stem cells can be differentiated into numerous cell types including blood cells and neural cells.23 The mononuclear cell fraction, which can be separated by density gradient method, contains various progenitor cells (hematopoietic stem cells, mesenchymal stem cells (MSCs), endothelial progenitor cells, and very small embryonic-like cells). Sharma et al24 carried out a clinical study on 71 pediatric cases with incurable neurological disorders, which included 20 cases of CP. The intervention consisted of intrathecal injection of autologous bone marrow mononuclear cells. These children were followed up regularly (mean follow-up of 15±1 months). Eighty-five percent of cases showed improvement. Symptoms such as neck holding, gross and fine motor activities, saliva drooling, swallowing, cognition, spasticity, dystonia, sitting and standing balance, muscle strength, ambulation, and speech improved significantly. No major side effects were observed. Similarly, 2 years later, the same group analyzed 108 patients where 92.6% showed improvements (Figure 1).25 Sharma et al26,27 also demonstrated two cases with CP, who were treated with autologous bone marrow-derived mononuclear cells. 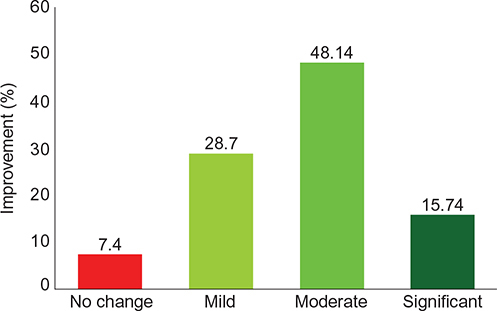 Six months follow-up recorded significant functional changes and improvement in Intellectual Quotient and Functional Independence Measure scale. The improvements in these cases correlated to the improvement in the positron emission tomography (PET) study conducted before and after cell transplantation. Improvement in metabolic activity of certain areas of the brain was noted (Figure 2). In a case report presented by Purandare et al,28 a child with CP treated with autologous bone marrow mononuclear cells showed improved motor, sensory, cognitive, speech, and bowel and bladder function. Grade III improved to grade I on the Gross Motor Function Classification System-Expanded and Revised scale. It also supported the findings that autologous bone marrow mononuclear cells are safe, effective, and feasible in CP patients. Figure 1 Improvements in cerebral palsy after cell therapy. Note: Graph demonstrating the improvements in 108 cases of cerebral palsy after autologous bone marrow mononuclear cell transplantation. Figure 2 Improvements on PET-CT scan brain after cellular therapy. Note: Comparative PET-CT scan brain performed before and after autologous bone marrow mononuclear cell therapy demonstrating improved FDG uptake in the marked areas of the brain. (A) PET-CT scan performed before cell therapy. The blue areas indicate hypometabolism. (B) PET-CT scan performed after cell therapy. The blues areas have reduced indicating an increase in FDG uptake. The green areas indicate normal metabolism. Abbreviations: FDG, fluorodeoxyglucose; PET-CT, positron emission tomography-computed tomography. Two children with spastic diplegic CP were given autologous UCBCs by Papadopoulos et al.36 On follow-up, these children showed functional improvement that was noted on Gross Motor Function Classification System.36 They also showed no major adverse events. Wang et al38 demonstrated improvement in a 5-year-old girl with CP after treatment with umbilical cord MSCs. Multiple doses of MSCs were given by intravenous and intrathecal injections. These MSCs were obtained from her younger sister. She was monitored for 28 months. Her immunity improved along with gross motor function, speech, physical strength, and cognition. In a study carried out by Luan et al,39 45 diagnosed cases of CP were administered neural progenitor cells obtained from aborted fetal tissue. On 1-year follow-up, these cases showed improved gross and fine motor functions along with cognition in comparison to the control group. The results of this study demonstrated safety and efficacy of this method. In 30 cases of CP, Chen et al30 administered NSC-like cells obtained from autologous bone marrow MSCs. As compared with the control group, the treated group showed improvement in language quotient and GMFM scores. Adverse events were not recorded. This implied the safety and efficacy of NSC-like cells in CP.30 In a double-blind, randomized, controlled trial conducted by Min et al,40 allogeneic UCBCs were transplanted in CP patients. These cells were also potentiated with recombinant human erythropoietin. Improvement in cognition and motor deficits was recorded. Metabolic and structural changes in the brain were also seen. A total of 1,255 patients with CNS diseases including 68 CP cases were transplanted with fetal olfactory ensheathing cells between November 2001 and January 2008.41 Based on the further observation, this research group concluded that transplantation of olfactory ensheathing cells into brain and spinal cord is feasible and safe, and can improve the neurological functions, including head and neck movement, pronunciation and swallowing function, relieve muscle tension, and/or decrease the progressive deterioration and improve the quality of life of CP patients to a certain extent. Among all the different types of cells used for cellular therapy, autologous bone marrow mononuclear cells are superlative. They are easily obtainable, available in abundance, and safe. Unlike embryonic cells, they do not have tumorigenicity and involve no ethical or moral issues. They are a combination of various cells and studies have shown that use of mixture is more beneficial as compared with subfractions. These cells also have a higher differentiation potential. Therefore, the current evidence for HBOT in CP is inconclusive and further studies are required. With this upcoming field of neurorestoration, it is imperative that researchers and clinicians should report any possible adverse event noted with the aforementioned new treatment modalities. The adverse events may be related to the route of administration or the medicine or type of cells. Minor side effects like headache, nausea, vomiting, and pain at the site of injection were observed in few studies, but they were self-limiting and responsive to medication. Seizure has also been found to be one of the adverse events of cell therapy in CP patients with previous history of seizures or abnormal electroencephalogram. It is recommended that all patients with CP should be evaluated for seizure before cell therapy and prophylaxis needs to be initiated in appropriate cases.55 Autologous cells have shown to be a safe option and allogeneic cells need further studies for safety. Numerous outcome measures to record changes in sensory, cognition, motor, behavior, and perception in CP are being explored.56 However, the cellular mechanism causing these changes should be studied in depth. Functional neuroimaging is a more sensitive modality to record changes brought about by neurorestoration. Functional neuroimaging is based on recording the cerebral blood flow and brain metabolism, which correlates with activity of neurons.59 Paracrine mechanisms are used to regulate the neuronal dysfunction in CP by neurorestoration strategies. Hence, it can be effectively used as a monitoring tool for neurorestorative techniques. Though there has been significant progress in clinical neurorestorative strategies, a lot of work still needs to be done. Translational studies have advanced the field from lab to patients. But more accumulation of evidence is required to draw any conclusive statements. Cell therapy and medicines are currently the major players for neurorestoration. Few studies have shown improved neurodevelopment with various types of cell therapy. However, optimum dosage, route of administration, potent cells, and timing of administration of cells need to be further studied to maximize their beneficial effects. Studies should include a functional neuroimaging or biomarkers (eg, cytokines, chemokines, growth factors, and so on), which capture the effects of neurorestoration in patients. There has been considerable advancement in neurorestorative strategies for CP, but a lot still needs to be studied to establish a definitive treatment. Combining various neuroprotection strategies with cell therapy should be our future focus. Improving the potency of various stem cells that have already shown to be beneficial would augment the clinical recovery. Comparative studies between various cell types and different strategies would advance our understanding of neurorestoration. Safety and efficacy of these novel therapeutic options should also be monitored and guidelines for translation from benchside to bedside should be outlined to promote the field of neurorestoration. Carroll JE, Robert WM. Update on stem cell therapy for cerebral palsy. Expert Opin Biol Ther. 2011;11(4):463–471. Novak I, Hines M, Goldsmith S, Barclay R. Clinical prognostic messages from a systematic review on cerebral palsy. Pediatrics. 2012;130(5):e1285–e1312. Irazábal M, Marsà F, García M, et al. Family burden related to clinical and functional variables of people with intellectual disability with and without a mental disorder. Res Dev Disabil. 2012;33(3):796–803. Rosenbaum P, Paneth N, Leviton A, et al. A report: the definition and classification of cerebral palsy. Dev Med Child Neurol Suppl. 2007;109:8–14. Lynn AK, Turner M, Chambers HG. Surgical management of spasticity in persons with cerebral palsy. PM R. 2009, 1(9):834–838. Cajal SRY. Degeneration and Regeneration of the Nervous System (translated by RM May). London: Oxford University Press; 1928. Wang Y, Gao B, Yang W. Clinical effect of oxiracetam capsules in the children suffering from cerebral palsy. Chin J Neuromed. 2007;4:409–411. Izhbuldina GI. Changes in the hemostasis system and free-radical lipid oxidation in the acute stage of ischemic stroke in patients on neuroprotection treatment. Zh Nevrol Psikhiatr Im S S Korsakova. 2012;112(3 Pt 2):31–37. Zhang C, Chopp M, Cui Y, et al. Cerebrolysin enhances neurogenesis in the ischemic brain and improves functional outcome after stroke. J Neurosci Res. 2010;88:3275–3281. Hassanein SM, Deifalla SM, El-Houssinie M, Mokbel SA. Safety and efficacy of cerebrolysin in infants with communication defects due to severe perinatal brain insult: a randomized controlled clinical trial. J Clin Neurol. 2016;12(1):79–84. Xiaoming L. Point injection of cerebrolysin in treatment of child cerebral palsy. Acta Acad Medicin Bengbu. 2004;29(4):331–332. Rong X, Zhou W, Chen XW, Tao L, Tang J. Ganglioside GM1 reduces white matter damage in neonatal rats. Acta Neurobiol Exp. 2013;73:379–386. Lee HS, Song J, Min K, et al. Short-term effects of erythropoietin on neurodevelopment in infants with cerebral palsy: a pilot study. Brain Dev. 2014;36(9):764–769. Jantzie LL, Miller RH, Robinson S. Erythropoietin signaling promotes oligodendrocyte development following prenatal systemic hypoxic-ischemic brain injury. Pediatr Res. 2013;74(6):658–667. Ohls RK, Kamath-Rayne BD, Christensen RD, et al. Cognitive outcomes of preterm infants randomized to darbepoetin, erythropoietin, or placebo. Pediatrics. 2014;133(6):1023–1030. Kinney HC, Haynes RL, Xu G, et al. Neuron deficit in the white matter and subplate in periventricular leukomalacia. Ann Neurol. 2012;71(3):397–406. Alvarez P, Carrillo E, Vélez C, et al. Regulatory systems in bone marrow for hematopoietic stem/progenitor cells mobilization and homing. Biomed Res Int. 2013;2013:312656. Gnecchi M, Zhang Z, Ni A, Dzau, VJ. Paracrine mechanisms in adult stem cell signaling and therapy. Circ Res. 2008;103(11):1204–1219. Daadi MM, Davis AS, Arac A, et al. Human neural stem cell grafts modify microglial response and enhance axonal sprouting in neonatal hypoxic-ischemic brain injury. Stroke. 2010;41(3):516–523. Sharma S, Yang B, Strong R, et al. Bone marrow mononuclear cells protect neurons and modulate microglia in cell culture models of ischemic stroke. J Neurosci Res. 2010;88(13):2869–2876. Brenneman M, Sharma S, Harting M, et al. Autologous bone marrow mononuclear cells enhance recovery after acute ischemic stroke in young and middle-aged rats. J Cereb Blood Flow Metab. 2010;30(1):140–149. Bianco P, Riminucci M, Gronthos S, Robey PG. Bone marrow stromal stem cells: nature, biology, and potential applications. Stem Cells. 2001;19(3):180–192. Sharma A, Gokulchandran N, Chopra G, et al. Administration of autologous bone marrow derived mononuclear cells in children with incurable neurological disorders and injury is safe and improves their quality of life. Cell Transplant. 2012;21(Suppl 1):S1–S12. Sharma A. Stem Cell Therapy in Neurological Disorders. Mumbai: NeuroGen Brain and Spine Institute; 2014. Sharma A, Kulkarni P, Sane H, et al. Positron emission tomography-computed tomography scan captures the effects of cellular therapy in a case of cerebral palsy. J Clin Case Rep. 2012;2:195. Sharma A, Sane H, Paranjape A, et al. Positron emission tomography – computer tomography scan used as a monitoring tool following cellular therapy in cerebral palsy and mental retardation – a case report. Case Rep Neurol Med. 2013;2013:141983. Purandare C, Shitole DG, Belle V, Kedari A, Bora N, Joshi M. Therapeutic potential of autologous stem cell transplantation for cerebral palsy. Case Rep Transplant. 2012;2012:825289. Mancías-Guerra C, Marroquín-Escamilla AR, González-Llano O, et al. Safety and tolerability of intrathecal delivery of autologous bone marrow nucleated cells in children with cerebral palsy: an open-label phase I trial. Cytotherapy. 2014;16(6):810–820. Chen G, Wang Y, Xu Z, et al. Neural stem cell-like cells derived from autologous bone mesenchymal stem cells for the treatment of patients with cerebral palsy. J Transl Med. 2013;11:21. Wang X, Cheng H, Hua R, et al. Effects of bone marrow mesenchymal stromal cells on gross motor function measure scores of children with cerebral palsy: a preliminary clinical study. Cytotherapy. 2013;15(12):1549–1562. Newcomb JD, Willing AE, Sanberg PR. Umbilical cord blood cells. Methods Mol Biol. 2009;549:119–136. Moise KJ. Umbilical cord stem cells. Obstet Gynecol. 2005;106(6):1393–1407. Chik KW, Chan PK, Li CK, et al. Human herpes virus-6 encephalitis after unrelated umbilical cord blood transplant in children. Bone Marrow Transplant. 2002;99:991–994. El-Cheikh J, Fürst S, Casalonga F, et al. JC virus leuko-encephalopathy in reduced intensity conditioning cord blood transplant recipient with a review of the literature. Mediterr J Hematol Infect Dis. 2012;4(1):e2012043. Papadopoulos KI, Low SS, Aw TC, Chantarojanasiri T. Safety and feasibility of autologous umbilical cord blood transfusion in 2 toddlers with cerebral palsy and the role of low dose granulocyte-colony stimulating factor injections. Restor Neurol Neurosci. 2011;29(1):17–22. Jensen A, Hamelmann E. First autologous cell therapy of cerebral palsy caused by hypoxic-ischemic brain damage in a child after cardiac arrest-individual treatment with cord blood. Case Rep Transplant. 2013;2013:951827. Wang L, Ji H, Zhou J, et al. Therapeutic potential of umbilical cord mesenchymal stromal cells transplantation for cerebral palsy: a case report. Case Rep Transplant. 2013;2013:146347. Luan Z, Liu W, Qu S, et al. Effects of neural progenitor cell transplantation in children with severe cerebral palsy. Cell Transplant. 2012;21(Suppl 1):S91–S98. Min K, Song J, Kang JY, et al. Umbilical cord blood therapy potentiated with erythropoietin for children with cerebral palsy: a double-blind, randomized, placebo-controlled trial. Stem Cells. 2013;31(3):581–591. Huang H, Chen L, Xi H, et al. Olfactory ensheathing cells transplantation for central nervous system diseases in 1,255 patients. Zhongguo Xiu Fu Chong Jian Wai Ke Za Zhi. 2009;23(1):14–20. Fischer UM., Harting MT, Jimenez F, et al. Pulmonary passage is a major obstacle for intravenous stem cell delivery: The pulmonary first-pass effect. Stem Cells Dev. 2009;18(5):683–691. Lim JY, Jeong CH, Jun JA, et al. Therapeutic effects of human umbilical cord blood-derived mesenchymal stem cells after intrathecal administration by lumbar puncture in a rat model of cerebral ischemia. Stem Cell Res Ther. 2011;2(5):38. Kondziolka D, Steinberg G, Wechsler L, et al. Neurotransplantation for patients with subcortical motor stroke: a phase 2 randomized trial. J Neurosurg. 2005;103:38–45. Shankaran S, Laptook AR, Ehrenkranz RA, et al. Whole-body hypothermia for neonates with hypoxic-ischemic encephalopathy. N Engl J Med. 2005;353:1574–1584. Rutherford MA, Azzopardi D, Whitelaw A, et al. Mild hypothermia and the distribution of cerebral lesions in neonates with hypoxic-ischemic encephalopathy. Pediatrics. 2005;116:1001–1006. Lei B, Tan X, Cai H, Xu Q, Guo Q. Effect of moderate hypothermia on lipid peroxidation in canine brain tissue after cardiac arrest and resuscitation. Stroke. 1994;25:147–152. Thoresen M, Penrice J, Lorek A, et al. Mild hypothermia after severe transient hypoxia-ischemia ameliorates delayed cerebral energy failure in the newborn piglet. Pediatr Res. 1995;37:667–670. Azzopardi DV, Strohm B, Edwards AD, et al. Moderate hypothermia to treat perinatal asphyxial encephalopathy. N Engl J Med. 2009;361:1349–1358. Gluckman PD, Wyatt JS, Azzopardi D, et al. Selective head cooling with mild systemic hypothermia after neonatal encephalopathy: multicentre randomised trial. Lancet. 2005;365:663–670. Gonzalez-Ibarra FP, Varon J, Lopez-Meza EG. Therapeutic hypothermia: critical review of the molecular mechanism of action. Front Neurol. 2011;2:4. Gonzales-Portillo GS, Reyes S, Aguirre D, Pabon MM, Borlongan CV. Stem cell therapy for neonatal hypoxic-ischemic encephalopathy. Front Neurol. 2014;5:147. Mukherjee A, Raison M, Sahni T, et al. Intensive rehabilitation combined with HBO2 therapy in children with cerebral palsy: a controlled longitudinal study. Undersea Hyperb Med. 2014;41(2):77–85. Lacey DJ, Stolfi A, Pilati LE. Effects of hyperbaric oxygen on motor function in children with cerebral palsy. Ann Neurol. 2012;72(5):695–703. Pérez-Gaxiola G. Hyperbaric oxygen did not improve symptoms in children with cerebral palsy. Arch Dis Child Educ Pract Ed. 2013;98(5):198. Sharma A, Sane H, Paranjape A, Gokulchandran N, Takle M, Badhe P. Seizures as an adverse event of cellular therapy in pediatric neurological disorders and its prevention. J Neurol Disord. 2014;2:164. Debuse D, Brace H. Outcome measures of activity for children with cerebral palsy: a systematic review. Pediatr Phys Ther. 2011;23(3):221–231. Bax M, Tydeman C, Flodmark O. Clinical and MRI correlates of cerebral palsy: The European Cerebral Palsy Study. JAMA. 2006;296(13):1602–1608. Li DK, Li MJ, Traboulsee A, Zhao G, Riddehough A, Paty D. The use of MRI as an outcome measure in clinical trials. Adv Neurol. 2006;98:203–226. Spiriev T, Sandu N, Schaller B. Molecular imaging and tracking stem cells in neurosciences. Methods Mol Biol. 2013;1052:195–201. Sandu N, Momen-Heravi F, Sadr-Eshkevari P, Schaller B. Molecular imaging for stem cell transplantation in neuroregenerative medicine. Neurodegener Dis. 2012;9(2):60–67.